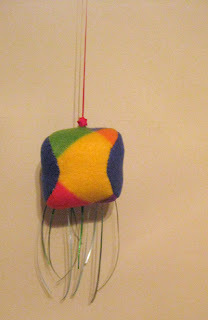 MacKomics Studio: Tending to the Pilot Light: More Plushies! 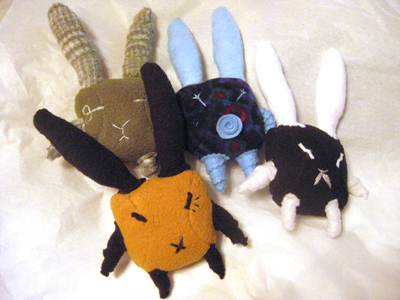 Tending to the Pilot Light: More Plushies! Last week was (king) soopers busy! in addition to the Thrifty Gifter Yarn Wrapped Wreaths workshop held on Tuesday and Thursday evenings, I squeezed in one last TTTPL session on Wednesday night. We made some really cute little pieces and since it is post-Christmas morning, I can show pictures of the pieces my daughter made for cousins and family as well as the crazy stuff I made for her! 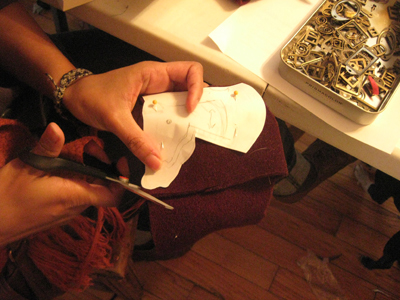 Here's a handmade pattern being cut out to make a cute little unicorn! 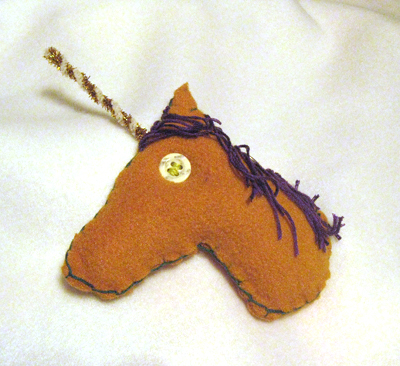 Here is the unicorn with all its fringe and pipe cleaner horn and a sweet contrasting blanket stitch around the edges. This cute Kitty Toy has a jingle bell hidden inside! Here are the amazing little big-eared creatures my daughter made for family member's stockings... each with its own character. Here's a closeup of the eye... 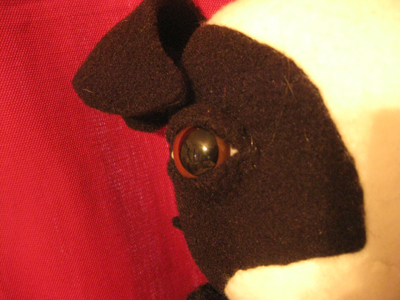 I used these Teddy bear eyes I had bought on speculation once while trying to beef up a craft supplies order without bumping up the shipping expense. I got the idea for overlapping fleece eyelids from these amazing creatures at the Wonderfair Gallery. 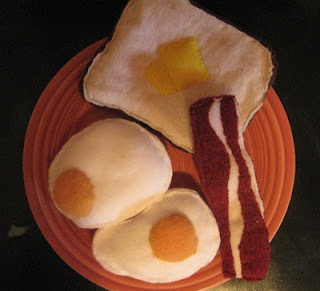 Here's the plushie breakfast plate special I made for my daughter's stocking...can you see the butter melting?! All in all, I am totally mad for plushies! I even saw a couple of books dedicated to them in the library in my favorite stacks...the 730's to 750's... I could just live back there! I hope you all had a lovely holiday vacation and am looking forward to lots of creativity in the new year! Check back often on my new "page" on this blog as I'm going to post a dress-a-day for 2012. 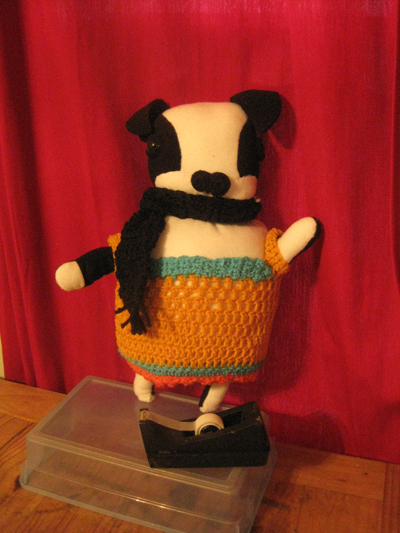 Also, I am bound and determined to finish the year of dresses for the Dress-up Challenge and have just one left to do. I am not sure why everyone dropped out soon after I took up the hosting of the challenge, but, just for my own sense of accomplishment, I'll make one more post tomorrow with the last two challenge submissions to make an even 12 dresses for the year. If anyone has any feedback or knows why this project petered out... please leave me a comment below. Cheers, I'm off to catch some of Lawrence's Final Friday Artwalk tonight - see you there? December Dress-Up Here is your Challenge! Tending to the Pilot Light: Home Made Stationery!